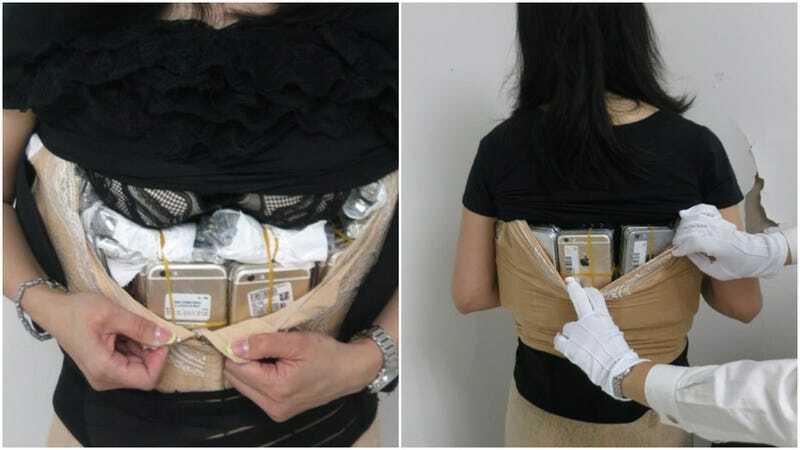 Customs officials in Shenzhen, China have arrested a woman with 102 iPhones stuffed into her clothing. Shenzhen borders Hong Kong, and, over the years, customs officials have arrested all sorts of smugglers. According to XMNN, customs officials recently stopped a woman after noticing that the way her body bulged appeared strange. The officials searched her, discovering she was allegedly smuggling 102 iPhones of various models as well as 15 luxury wrist watches. The total weight of her haul was over 44 pounds. This arrest surpasses the smuggler caught with 94 iPhones back in 2015, but not the one caught with 146 iPhones that same year. For now, that record appears unbroken.